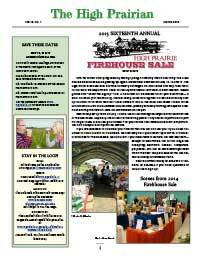 The March 2015 High Prairian is Out! 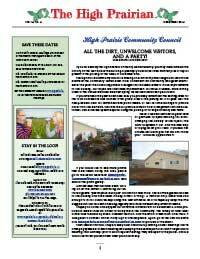 The latest High Prairian is now available for download or online viewing. Read about the latest community happenings, not the least of which is the upcoming Firehouse Sale, a trip to Argentina, High Prairie vacation rentals, Fire District 2014 recap, a summary of the Forest Health workshop and some stunning wildflower photos to usher in Spring. Besides the HPCC news and updates from the Fire District there are instructions for DYI paper snowflakes (useful if you have children in your house over the holidays that need something to do) and a sampling of seasonal recipes. The last in the Treasures of Music Series caps off this Christmas edition.